The Canadian Nuclear Safety Commission (CNSC) has signed a memorandum of understanding (MOU) with the National Nuclear Safety Administration (NNSA) of the People’s Republic of China, to cooperate and exchange nuclear safety regulatory information about the peaceful use of nuclear energy. CNSC President Michael Binder signed the MOU in Ottawa. The MOU entered into effect on August 28 when it was signed in Beijing by Li Ganjie, the NNSA Administrator. 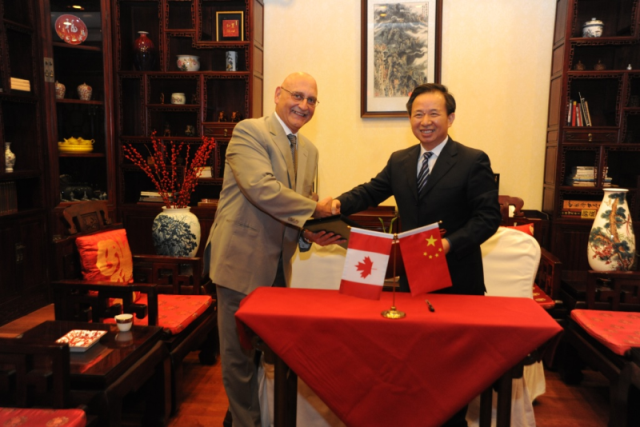 CNSC Executive Vice-President and Chief Regulatory Operations Officer Ramzi Jammal witnessed the signing in China. The MOU provides a framework for the CNSC, as Canada’s national nuclear regulator, and the NNSA, as China’s regulator of nuclear safety, to exchange technical information about topics such as the regulation of nuclear facilities and radioactive sources, and radiation protection. The MOU provides clear guidance about the organization of cooperative activities and responsibilities for the security of information exchanged. The CNSC establishes and maintains regulatory cooperation arrangements with its international counterparts to share information and best practices, with a view of further enhancing nuclear safety and security in Canada and abroad. MOUs are non-legally binding documents that express commitments. The CNSC maintains similar arrangements with nuclear regulators in 19 other countries. Canada and China signed a legally binding agreement for cooperation in the peaceful uses of nuclear energy in 1994. To facilitate the fulfillment of the agreement, the CNSC signed an administrative arrangement with the China Atomic Energy Authority in 1997. NNSA Administrator Li Ganjie and CNSC’s Ramzi Jammal.